I've often received questions about the differences between high-clarity low-iron glass tanks and normal glass tanks, so for those who are new to the hobby... here is a visual comparison for reference. The tank on the left is made from normal "float" glass, it has a noticeable greenish tint. The tank on the right is made from high-clarity low-iron glass and looks almost clear. 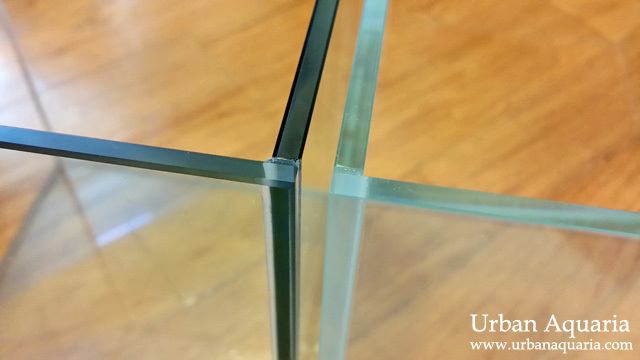 High-clarity low-iron glass tanks are sometimes also labelled as "crystal" or "optical" glass. The light transmission for this type of glass is much higher, which results in brighter light perception and more accurate color rendition when viewing the tank. Where do you buy your tanks from? 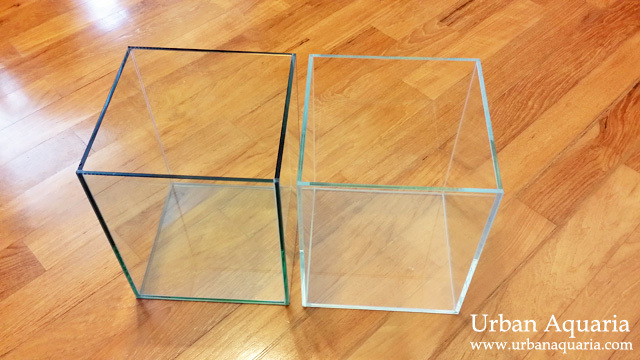 I'm looking at getting a custom 75cm tank done from EO.they suggested 3 sides crystal glass and 2 normal(back and bottom). Also, for a 75cm tank any suggestions on a light? I noticed all your tanks have the up aqua pro led on them. Nowadays i buy most of my tanks from Seaview Aquarium (Seletar West Farmway 2), they regularly stock a wide selection of crystal glass tanks in various standard dimensions. For a custom made 75cm tank, the unusual length does require some considerations in terms of lights. I guess you could try using either one 60cm light and suspend it higher to spread out the light, or a 90 cm light and just let it overhang abit over the sides. As for light brand and models, it all depends on your tank and plant requirements. Majority of the setups and plants i keep don't require as much light, so the Up Aqua Z-Series ones are more than sufficient for my usage. If you find that your plants need more light, then you could look at other brands with more powerful models like Odyssea or Chihiros... or even higher end brands like MaxSpect or AI (if you have the budget). Thanks a lot for the suggestions. I'm planning on trying out the DSM for HC based on your blog. Would a 60 cm light do justice to the growth ? I have CO2 so the light is my main worry right now. My budget is also around 75$ for the light. Is the beamswork​ hi lumen 60 as powerful as the up aqua pro 60? Also, it's been a while since your last post. Anything new Ur working on ? I guess you'll just have to try and see... for my tank setups the Up Aqua Z-Series lights were sufficient, so i guess you can base on that as a reference. The Beamswork Hi-Lumen 60 should be more powerful than the Up Aqua lights (based on LED and wattage specs), so it should work.